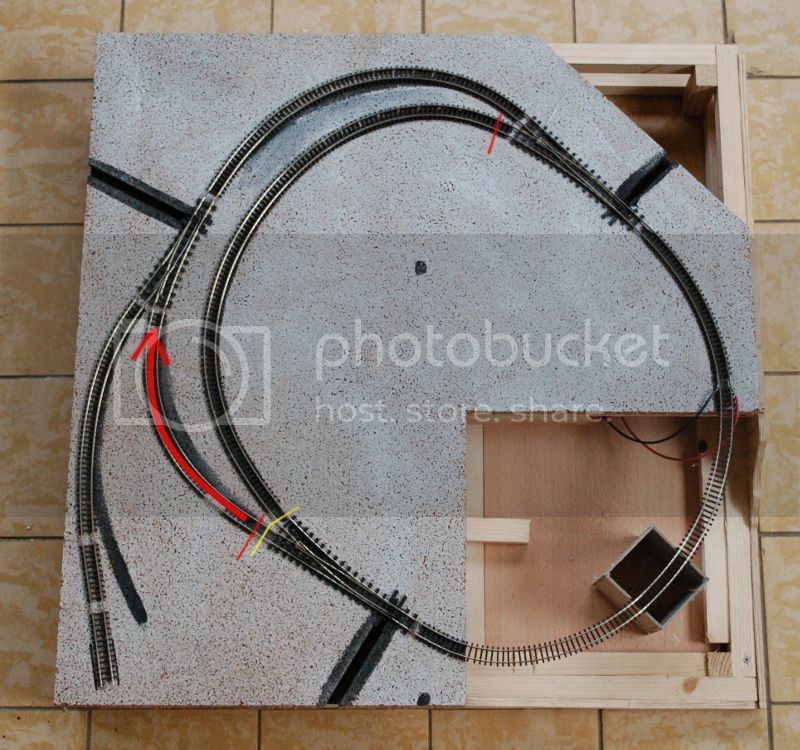 Finally I'm able to start building a layout again. 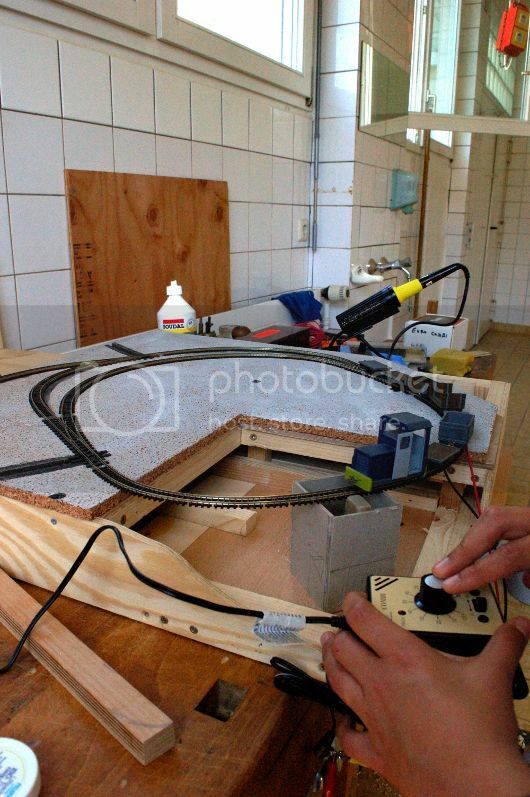 I'm working on a 'Father and Sons' project in 1:55 currently called 'the Kreisbahn'. In German 'Kreis' can mean 'county' so it would be the 'county railway' but it also means 'circle', which pretty well describes the trackplan. I just mention that so English speakers can join in the hilarity. There may be more bad puns as the boys rather enjoy them., You have been warned. This is where we are at the moment. THe plan is for it to ba a small agricultural/forestry railway that has developed into a common carrier. The cunning plan is to have a two sided layou with a backscene between them. One side would be a 'Town' scene and the other more rural. The hole between the two will possibly be a warehouse so we can exchange wagons. We aren't sure about that bit yet. Our only locomotive so far is this rather battered scratchbuilt one from an earlier 7mm ng layout, which actually works out just fine in 1:55 scale. Progess is slow but we'll update as and when we have more to show you. 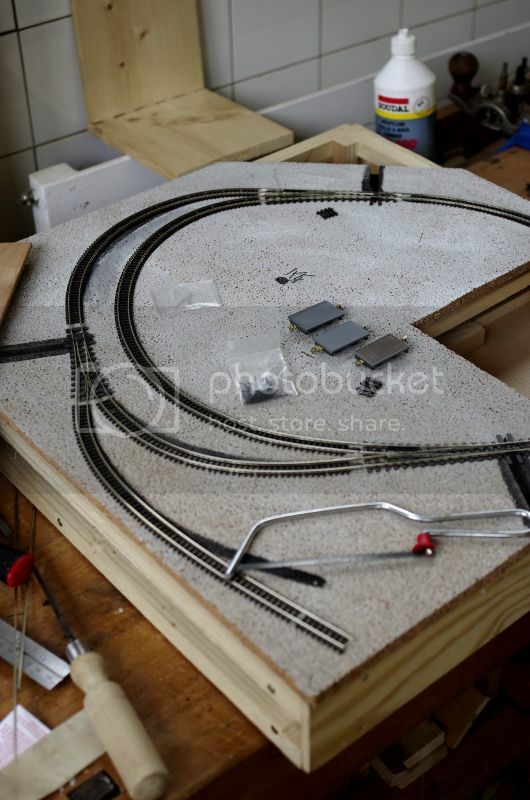 great to see someone modelling 1/55 on 9mm gauge track, which works out to be close to 50cm gauge in reality. Are you a member of the 5.5mm/ft society? They also have a facebook page, but the scale is still dominated by the 12mm gauge brigade. This is a pity as the scale has a lot of potential using 9mm gauge as well as 16.5mm gauge, both having low cost motorized chassis available. Hello Simon...yes, I'm a member: they're a very friendly bunch and the magazine shows more variety than is apparent online: there are a number of people using 9mm gaiuge and a few of us using 16.5mm as well. The origins of the group are in 12mm gauge, which GEM produced models for. Thy are now produced by one of the group. GEM did think of doing something for 16.5mm gauge, a logical development considering they had done some 3ft gauge stuff for 4mm/ft. I am planning mini projects in 9mm,12mm and 16.5mm gauge. The 16.5mm will be for a French project, well 2 projects, one based on Cf de Camargue, and the other a more typical French one with Corpet and a railcar. I have some of Tom Bell's items for a 9mm gauge mini project. Still not sure about the 12mm gauge, as it might just be somewhere to display the couple of ex WW1 locos I have. I am hoping to get to the group event in September, one advantage of having many in the group based up her in north west. You can see the one feed on the model in the picture.All the points are Electrofrog and the lower one in the picture is insulated on all four rails at the frog end. Would anyone reccomend another feed anywhere? I have a couple of combinations that cause things to stop dead, but they tend to offer 'flank protection', so I'm inclined to leave it as it is unless anyone has another suggestion. 2: Make a bigger loop on the coupling. 3: Make the loco coupling pivot. 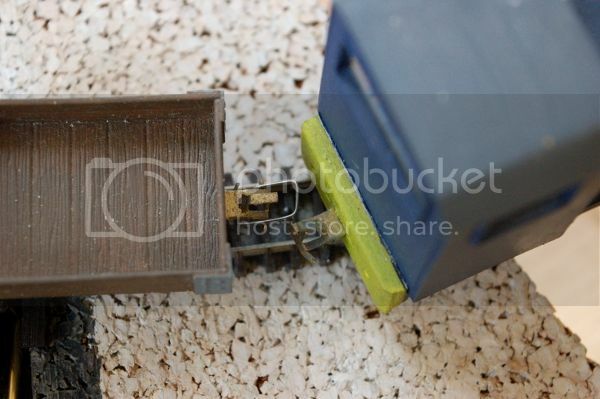 4: Rebuild the locomotive so it is even shorter and the couplings are less than 1 cm away from the wheels. 6: Give up and take up Yak breeding as a hobby. And how would you avoid it happening in future? Yes, no-one seems to know why GEM didn't go for that in a big way, as there is a whole sack of Irish NG prototypes out there. 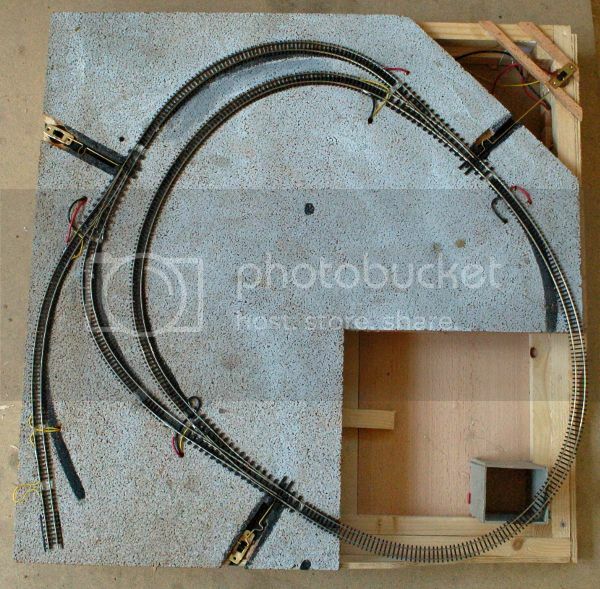 But then, that question could be asked of someone using an obscure gauge/scale combination tomake European Metre gauge when any sensible person would just use Bemo H0m stock. Andy, as far as I know I am the only person in group to have been told by GEM about plan to do 3ft gauge. It was at one of the Manchester exhibitions around about 1990/1 when GEM had a stand selling off old warehouse bits. I was chatting and chap(not sure who it was but asume it was someone who knew), told me that they had planned a 3ft range using 16.5mm gauge, but when they stopped doing the 12mm stuff they did not proceeed. Have to remember that there were not many, if any other companies producing stuff for 1/55(not even sure if Siku were around then), and it is only now that with wargaming 28mm figures and loads of accesssories and buildings that it has been possible without scratchbuilding everything. I had originally planned to go for 1/64 but the Corpet was too small for the chasssis I wanted to use so I upped to 1/55 and found there was actuallly far more available than in 1/64. The 2 vans Lledo did of French vehicles were actually 1/55,, and quite a lot of diecast(presume to match Siku) were actually1/55. Norev do a big range of cars in 1/54 which is near enough. The more scale wargaming models are quoted as 1/56, again very close(better than using O scale vehicles as some have done!). When it comes to using 16.5mm gaugeto represent metre gauge, I use the fact that Gordon Gravett used EM gauge for his French layout in 1/50 scale which is under gauge by 2mm as well. I think he might have now wished he had opted for an easier scale .Purists can always use EM gauge for 1/55 if they want. As I said there is probably now much more available for 1/55 than 1/64. I have just been looking at my book about the Rye and Camber 3ft gauge line and I think that might be added to my list of possible models. 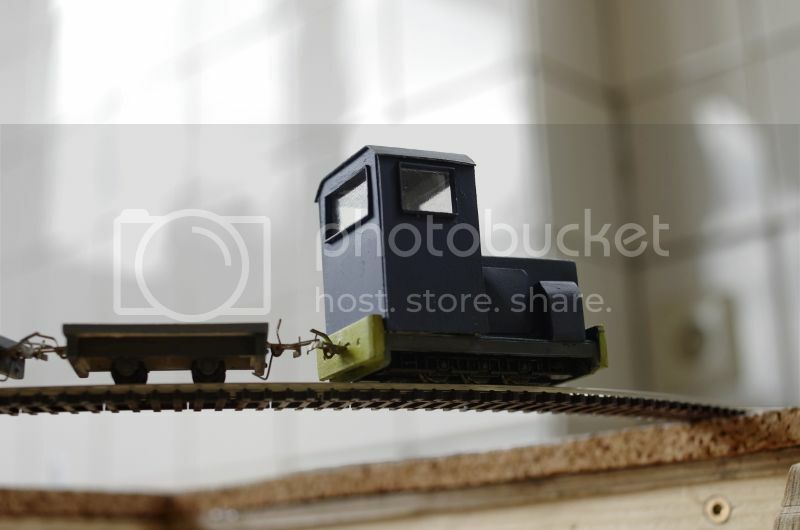 Although there have been 3ft gauge layouts in this scale done, modelling Welsh narrow gauge has bee favoured option for many of the original and older members of the group, and tend to be used to represent the scale at exhibitions. Hopefully by showing layouts using 9mm and 16.5mm gauge might tempt more into the scale, and I have suggested talking to wargaming people as well, and producing a list of all manufacturers and suppliers. I started a list, but someone suggested a list of those offereing discounts etc. Sorry, but I find that the wrong approach, as I want to be able to find more. This is the norm with other groups. Will be interesting to meet up with some at group meeting(AGM?) in September. Re the derailing wagon, a wider loop on the coupling would be the simplest solution, making the loco's coupler pivot is second favourite. 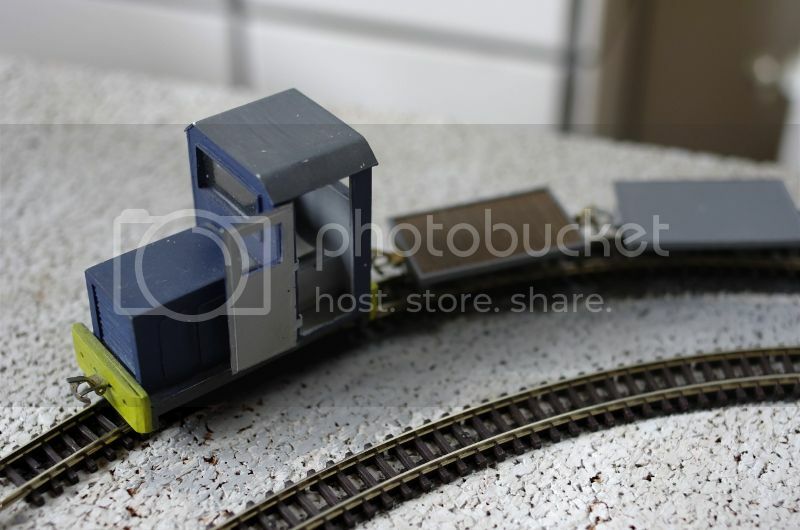 The larger loop would probably be the easier option as I suspect the loco has a fixed chassis, with no pony truck which could be used to help the coupler pivot with the track's curvature. Layout's coming along nicely, too. I look forward to seeing what the scenic treatment will be like. 1: Curve eased over the future viaduct. I possibly went to the opposite extreme with this. Despite appearances it is within the baseboard, just. 2: Inside loop curve eased to avoid kink in the track. 3: Insulating fishplates on outer loop moved to position shown to allow two trains in the outer loop at once. I'm not sure if this isn't overkill on a tiny layout like this, but it is nice to have and as it took 20 minutes to put one of the insulating rail joiners on, it stays that way now. Point control was added over the weekend. I'll bore you about that another time. The wagon that came off the track before and started this process, now has a new favourite place to derail, but that is one of those things that has to be, and an example of the unfairness of the universe.